ZELL AM SEE, Austria — Time stands still in the office of the late Butzi Porsche, who designed the legendary 911 nearly six decades ago. On the wall hang drawings by his aunt Louise and son Kai; in the corner is a stain on the floor where his dog Rocky slept while he worked. A small assortment of pipes lies neatly arranged on the desk, and in the display cases on the far wall dozens of model cars are lined up alongside books and Porsche fan club insignias from around Europe. "Everything is as it was when he left, furniture and all," says Roland Heiler, chief design officer of Porsche Design, whose own office faces the small, modest room. "For us, it's a bit like the holy grail." It's here in the Austrian Alps that Butzi, who died in 2012 at 76, worked within view of the Schüttgut estate — the family's safe haven purchased to escape the Allied bombing of Nazi Germany. 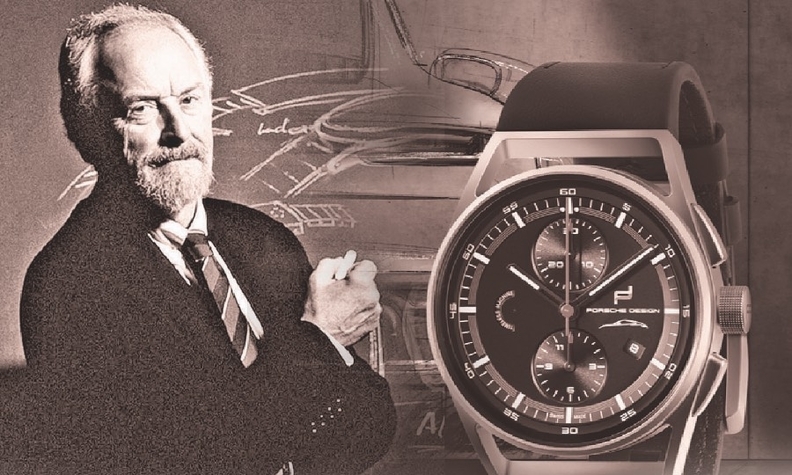 Butzi, the son of the sports car maker's founder, Ferry Porsche, was a fan of wristwatches. Indeed, his passion lives on in Zell am See, headquarters of the design company he founded, which is the only watchmaker wholly owned and operated by an auto manufacturer. The studio will issue a watch — the €4,911 ($5,600) Porsche Design 911 Chronograph Timeless Machine Limited Edition — to celebrate the launch of the eighth-generation 911. The first watch Butzi developed after forming the company was the Chronograph I in 1972. Inspired by the low-glare cockpits of race cars, it was the world's first matte black wristwatch designed for maximum contrast and optimal readability. Tom Cruise wore a Chronograph in the 1986 film Top Gun. Today, Porsche Design Timepieces is a niche business, selling about 1,000 high-end watches a year. They are designed here and manufactured in Switzerland, and they largely retain the visual dominance of white indicators set over a pitch-black dial. Each clockwork's housing is fashioned from the brand's signature material, titanium. The straps are often composed of the same leather and stitching found in Porsche cars. "An important element for our customers is that they sense that same unique feeling on their wrist as they do when grabbing the wheel of a 911," said Gerhard Novak, general manager in charge of the business. Porsche Design Timepieces, a wholly owned subsidiary since 2016, partners with its more famous parent on specific projects including a special Chronograph 911 Turbo S Exclusive Series. Only customers who bought the car could opt to pay over $11,000 for a matching wristwatch in the same color trim pattern, an identical number plate linking the two. Recently, the small operation even gambled on creating its own time mechanism, rather than rely on the Sellita or Valjoux movements often used in other premium watches such as TAG Heuer, Omega or Breitling. Engineering clockwork isn't any easier than engineering a vehicle. The official Swiss-certified Werk 01.200 was the result of three years of development. "It's an absolutely unique differentiator of Porsche that we have our own timepiece manufacture," said Novak. Nevertheless, you won't find the sports car brand's characteristic logo anywhere on the dial. "That would be merchandising," Novak said, with a hint of distaste.